Despite strong growth figures recorded in the Europe, Germany in particular, and the United States economic growth in both regions will remain at slow pace as per the IMF chief economist Olivier Blanchard. His remarks were published on Monday in a French newspaper Le Figaro, Reuters reported. He reiterated that the euro zone governments should deliver credible plans so as to reduce their budget deficits for medium terms. Instead of stipulating target dates only the contents of the plans would reassure financial markets about the financial health he remarked. “Whether it is 2013 or 2014 is not important,” he said. A slowdown in the US would have automatic impact on growth in the short term Mr. Blanchard was quoted as saying. He might be referring to the dependent on exports to the US of the major players of Asia China, Japan and India. Exports from the three countries are majorly destined to the US and hence the impact. China recently concentrated on developing domestic market to relieve itself from depending on exports to the US. Japan market is already saturated and the haunting deflation for Japan is preventing it to shift priorities in trade it seems. Decreasing prices prevent consumers to come to shops as they expect the prices may further slip. That is making hard for Japan to increase consumer spending. 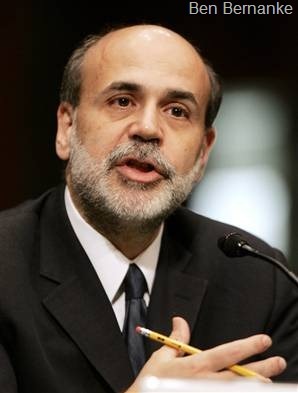 U.S. Federal Reserve Chairman Ben Bernanke said on Friday the economic recovery has weakened more than expected and the Fed stands ready to act if needed to spur slowing growth. Bernanke downplayed concerns that the economy might slip back into recession, predicting a modest expansion in the second half of this year, with the pace picking up in 2011. Otherwise, he said the Fed has sufficient ammunition left and could support growth by purchasing more government debt or by promising to keep rates exceptionally low for a longer period than currently priced in by financial markets. Bernanke’s comments, in an address to an annual conference of global central bankers hosted by the Fed in Jackson Hole, Wyoming, came as the government reported the economic growth rate in the second quarter was weaker than it had originally estimated. 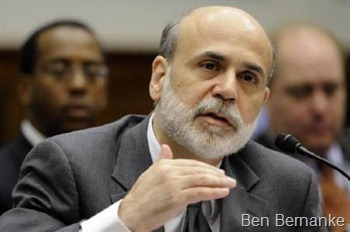 Bernanke made clear that the U.S. central bank has not decided what would prompt additional easing. "The overall tone was one of watch and wait," Goldman Sachs economist Jan Hatzius wrote in a note to clients, "despite ongoing signs that U.S. economic activity has not only dropped below its potential growth rate but has a significant probability of weakening further." While Bernanke focused on near-term issues in the U.S. economy, the head of the European Central Bank, Jean-Claude Trichet, also speaking at the Jackson Hole conference, addressed long-term global challenges. He urged governments and central banks to ensure that the transition from very high debt levels incurred in response to the global financial crisis and its economic fallout takes place in an orderly fashion and without compromising economic growth. "The primary macroeconomic challenge for the next 10 years is to ensure that they do not turn into another ‘lost decade,’" Trichet told the conference. In Japan, which has experienced decades-long stagnant growth, the Bank of Japan is examining holding an emergency meeting early next week to ease monetary policy as the strong yen threatens the country’s fragile economic recovery, a source familiar with the matter said. An emergency meeting may be held as early as Tuesday. Goldman Sachs Group Inc. cut its growth forecasts for the world’s two largest economies on signs that stimulus boosts will wane. Japan will grow 1.4 percent in 2011, compared with an earlier forecast of a 1.7 percent expansion, Tokyo-based senior economist Chiwoong Lee said in a report dated Aug. 7. Goldman last week lowered its projection of U.S. growth for the same year to 1.9 percent from 2.5 percent. A report today showed Japan’s current-account surplus narrowed for a second month as export gains cooled, adding to concerns that the recovery is losing steam. Government incentives that have bolstered spending at home are wearing off, with economists forecasting second quarter gross domestic product grew at half the pace of the previous period. Nomura Holdings Inc., one of the 18 primary dealers that trade with the Federal Reserve, said policy makers will “ease” at their Aug. 10 meeting, though what form it takes is debatable. Central bankers may change the language of their policy statement to signal that the Fed’s balance sheet will remain expanded and change policy on the mortgage program to start reinvesting paydowns, the firm said in a note to clients today. There is also a chance of other actions, such as a cut in the rate on excess reserves, Nomura’s global economics team said. Nomura changed its viewpoint because of a softening of the comments from policy makers such as Philadelphia Fed President Charles Plosser and St. Louis Fed President James Bullard. The firm also cited the Fed’s downward revision for growth and the slack in the economy that threatens to push inflation to an unacceptably low level for Fed Chairman Ben S. Bernanke. “Easing is going to be very seriously considered given several months of disappointing data and the very dovish tone of public commentary across the spectrum,” said Zach Pandl, an economist at Nomura Securities International in New York. “If the Fed is averse to buying more assets, then cutting the rates of interest on reserves could be the next option.” Bullard said yesterday that the central bank should resume purchases of Treasury securities if the economy slows and prices fall rather than maintain a pledge to keep rates near zero. The worst U.S. recession since the 1930s was even deeper than previously estimated, reflecting bigger slumps in consumer spending and housing, according to revised figures. The world’s largest economy shrank 4.1 percent from the fourth quarter of 2007 to the second quarter of 2009, compared with the 3.7 percent drop previously on the books, the Commerce Department said today in Washington. Household spending fell 1.2 percent in 2009, twice as much as previously projected and the biggest decline since 1942. “We do tend to get bigger revisions at turning points in the economy,” Steven Landefeld, director of the Commerce Department’s Bureau of Economic Analysis, said in a press conference this week. On the more positive side, “in the past, we’ve tended to undershoot the recovery” as well, he said. 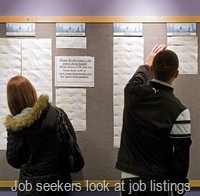 The data better explain why the jobless rate doubled, reaching a 26-year high of 10.1 percent in October, and has been slow to subside. The government also boosted personal income levels for each of the past three years, propelling the savings rate higher and signaling households are further along the process of repairing finances. The rebound from the recession has been more subdued in the last six months of 2009, as the economy grew at an average 3.3 annual pace from July 2009 through December, instead of the 3.9 percent previously projected. By comparison, growth averaged 7.2 percent in the two quarters following the 1981-82 recession, during which the economy contracted just 2.9 percent. The worst quarter of the current economic slump is now the final three months of 2008, in the immediate aftermath of the collapse of Lehman Brothers Holdings Inc., rather than the first quarter of 2009. GDP shrank at a 6.8 percent pace from October to December 2008, exceeding the prior estimate of 5.4 percent, making it the deepest quarterly drop since 1980. The new data showed the peak of the last expansion occurred in the fourth quarter of 2007 rather than the second quarter of 2008. The figures are more in sync with the recession chronology prescribed by the National Bureau of Economic Research, the accepted arbiter of U.S. business cycles. The Cambridge, Massachusetts-based private group determined the slump began in December 2007, and has yet to announce when it ended. Consumer purchases, which account for 70 percent of the economy, were cut for each of the past three years, with the biggest reduction taking place last year. Less spending on services than previously estimated, including financial services and auto repair, was responsible for the change. The dollar declined 2.24 percent, the most since May 2009, to $1.2930 per euro yesterday, from $1.2641 on July 9. It touched $1.3008 yesterday, the weakest level since May 10. The U.S. currency dropped 2.3 percent to 86.57 yen, from 88.62 yen, after reaching 86.27 yesterday, the lowest level since Dec. 1. The euro was little changed at 111.96 yen, compared with 112.01. The euro has rallied 8.9 percent versus the dollar since reaching a four-year low of $1.1877 on June 7 as concern eased that Europe’s sovereign-debt crisis would undermine the region’s economic recovery. Spain, which has the third-largest deficit in the euro region, drew higher demand in its sale of 3 billion euros ($3.8 billion) of 15-year bonds on July 15. It attracted bids worth 2.57 times the securities offered, compared with 1.79 in an April auction. The US economy grew at an annual rate of 2.7% in the first three months of 2010, slower than previously estimated. The Commerce Department had previously estimated growth at 3% versus the same period in 2009. The new figure is disappointing as it is only the third quarter since the US economy stopped contracting, and in past recoveries growth has been faster. Markets took the news in their stride, with the dollar little-changed, and New York shares opening slightly up. Business investment and consumer spending – important components of GDP – were both revised down. However, inventory adjustments were revised up. Following a recession, companies typically spend money rebuilding their stock of goods for sale – a transitory process that boosts GDP growth in the early stage of a recovery.